(April 9, 2019 – Euless, TX) Dan Sosa. 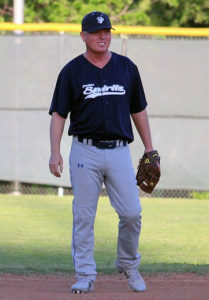 The Spirits (40+) can love to hate the guy, but the guy has something on this team. In past seasons and getting right back in the saddle this season, the crafty left-handed pitcher always seems to find the appropriate combination of pitches to keep the Spirits hitting limited. You can always expect that there will be a 1 to 0, or 2 to 1 score nearby when Sosa takes the mound. Tonight, he was donned in maroon colors for the Otters, yet another new face the Spirits squad was facing in DFW ABA league play during the 2019 campaign. And with Mother Nature throwing 35-40+ mph winds blowing directly in from center field, this game was headed to the circus. 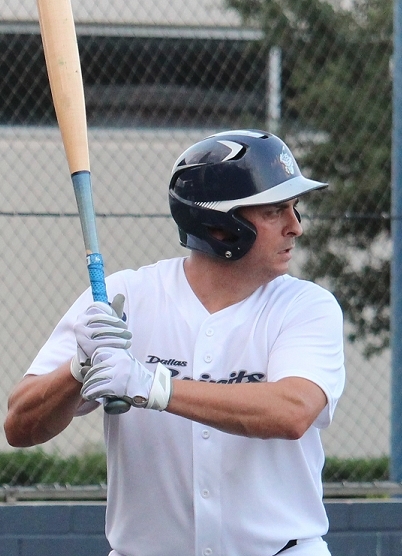 Sosa’s teammate from another league and lead off hitter, Stacy Scott got things started quickly for the Spirits as he slapped an opposite field single to give the Spirits a runner. John Hefner flew out to the infield and the invisible blowing wall being dealt by Mother Nature, and a pair of infield ground outs squeezed runners trying to advance to end the Spirits half of the first. John Holmquist took the start for the Spirits and looked good from the get go. Wind-aided or not, Holmquist had the right stuff and was dealing. He immediate sent Kevin McEnna back to the dugout after striking him out, but Marc Mehlman countered with a one-out single to give the Otters a base runner. Holmquist was able to get Walker to ground out, allowing Mehlmen to advance to second, but John rebounded to get Paul Taylor to fly out to end a scoreless first inning. The Spirits drew first blood in the second after Shawn Lee singled. Chris Lewis went down on strikes, but Brant Finchum patiently drew a base-on-balls and the Spirits has two on with one out. 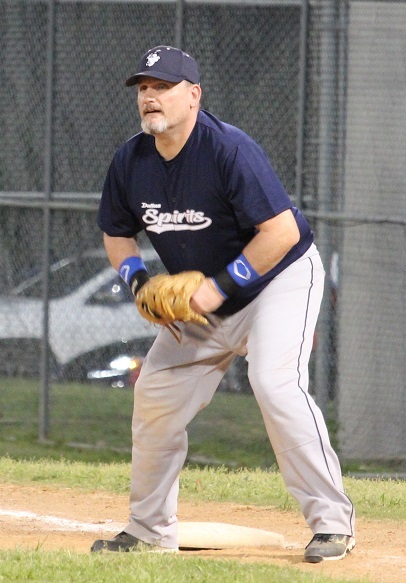 Eric McPherson singled to load the bases and Brian Hackney reached on a fielder’s choice that squeezed Finchum at third, but allowed Lee to score to give the Spirits a 1 to 0 lead. Sosa was then able to get Earl German to ground out to save face. The game remained in pitcher’s duel mode until the third when Holmquist came up lame. After getting the first two outs in the inning, Holmquist ran into a major muscle cramp in one of his calf muscles and had to leave the game. Finchum took over on the bump and was greeted with a single by McEnna. Mehlman followed with another single and a throwing error by Scott, who was attempting to make a great play throwing across his body allowed McEnna to score and tie the game. Finchum was able to get Walker to ground out to end the inning with the game tied, 1 to 1. Things remained quiet offensively although the howling winds blowing through were anything but quiet in the ear holes of each batter that faced Sosa and the wind behind him. However the Spirits were able to make a little noise of their own after Hefner doubled over the head of the Otters left fielder to start off the inning. Kirk Sipila grounded out to push Hefter to third and a single by Patrick Bilgere gave the Spirits a 2 to 1 lead. Lee followed up with another single to give the Spirits a pair of runners, but Lewis went down on an infield fly and Finchum lined out to end the inning. Finchum was able to get the Otters 1-2-3 style in the bottom half of the inning and the Spirits offense added some insurance in the top half of the seventh after McPherson singled and later stole second. Hackney doubled down the left field line to score McPherson and the Spirits nearly made it 4 to 1 when Hackney attempted to score on a single by Jack Nash, but the Otters center fielder used the incoming jet stream to throw a one-hop strike to home plate to tag out Hackney easily. David Tipton then attempted another bid at moving runners, however his line drive was caught before he was able to leave the batter’s box and the Spirits headed back to defense with a 3 to 1 lead moving into the game’s final frame. Finchum was able to get the first two batters to ground out, but Paul Taylor kept things interesting with a single to give the Otters life. The game then took a strange turn after Taylor advanced to second on a wild pitch. The next Otters hitter, Jim Johann hit a hard grounder toward McPherson at short, when Taylor crossed the path of the roller and then paused to try to distract McPherson momentarily before he continued to third. The home plate umpire wasn’t having any of that and immediately called Taylor out for runner’s interference and just like that, the game was over. The Otters put up a brief stink with the umpire, however the ump stuck to his decision and the Spirits left with a 3 to 1 victory. Bilgere, Lee, McPherson and Hackney each led the Spirits offense with 2 hits each. For the Otters, it was Mehlman and Taylor each with two hits as the combination of Holmquist and Finchum only allowed the Otters a total of one run on 6 hits, with one free pass to first and 3 strikeouts. For Sosa and his Otters defense, he went the distance in the loss, allowing 3 runs on 12 hits, while walking 2 and striking out 2. The Spirits travel to Texas Star and Legends Field next Wednesday night as they visit the heavy-hitting Dallas Redbirds. First pitch is slated for 8:45PM and you can click here for schedule details and directions.